There are tons of way to get a bigger and better muscle out there. You can try the supplement, gym, or even home-training. The home-training sometimes becomes a great choice for people who don’t like the crowded area or for you who love a quiet and simple exercise. In the gym, you need to spend a good amount of money every year or month, and you also need to have guts to go there daily or weekly. These activities are pretty much cutting your time. That’s why you probably need to try doing exercise in your home, especially the light exercise. Here is a very useful equipment for your training session, Bowflex 552. 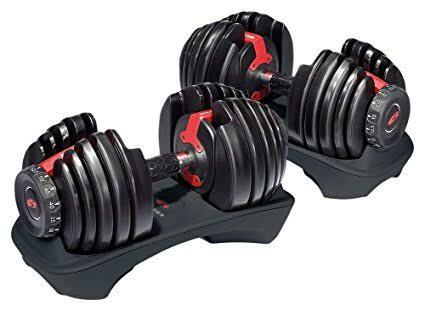 Bowflex 552 is a pair of dumbbells which can adjust the weight from 5 to 52.5 pounds. It is a very versatile equipment as you can use it in many ways. You can combine it with 15 sets of weight which conclude the unique dial system or you can just use it casually for your daily dumbbells training. So if you are interested with Bowflex 552, let’s see the explanation below. Bowflex 552 is pretty decent in its performance. It shows that people are experiencing a good session using this dumb bells. Not only that it gives the same result like in the gym, but it also gives you the comfort and versatility to use it in your own way. The only thing that is quite bugging is about its shape which is a little too big and bulky. This bulkiness limits some motion in the certain kind of exercises. For example, if you want to do the press you can’t get the extra squeeze in unless you turn the palms inward. Other complaints are about its shape which is too rectangular and about how it is not solid enough in some people’s hand. In overall, Bowflex 552 has proved us its capability for the beginner and moderate users, but not for the expert users. That’s why some people who are commenting about how it is not solid enough can try the better version which fits the class of the user. You can’t expect too much as this product is intended for the beginner and not for every fitness class.